A cloud connection is one that is brokered by RealVNC’s cloud service. Cloud connections are extremely secure, convenient and reliable, but both the remote computer you want to control and the local device you want to control from must be connected to the Internet. Once brokered, where possible, our cloud service then negotiates a peer-to-peer session between two endpoints, so session data is transmitted directly between them; this is likely to be more performant. However, intermediate network hardware may mean this is not possible, so the cloud service automatically falls back to a relay session if necessary, to ensure the cloud connection succeeds. Note that session data relayed via our cloud service is encrypted end-to-end, so cannot be deciphered by RealVNC, nor anyone else. If you need to comply with a particular regulatory compliance regime that disqualifies session data being routed via our servers, you can disable relayed cloud connections. Note, however, this does mean these connections will fail. On the remote computer you want to control, make sure cloud connectivity is enabled. Authenticate to VNC Server running on the remote computer. The password you enter depends upon which subscription you have. Find out what this is. For Home and Professional subscriptions, cloud is the only connectivity option, so it is automatically enabled, and cannot be disabled. If you have an Enterprise subscription, you have more flexibility. You can establish a cloud connection to a particular computer, a direct connection, or both. Read our guide to cloud versus direct for more information. If you sign in to VNC Server at install-time using your RealVNC account credentials (email address and password), simply follow the in-app instructions. If you enter a license key (either desk-side or remotely), follow the instructions below to add the computer to the team. To obtain a TOKEN, navigate to the Deployment page of your RealVNC account. Either copy and paste the token itself, or download the JSON file and specify a path. ...adds the computer to the team (providing the token is valid) and, within the team, to the Sales and Win groups (providing they exist), plus specifies a meaningful name. You can disable cloud connectivity for a remote computer, but note that VNC Viewer users will never be able to automatically discover and establish cloud connections to it. Only direct connections will be possible. 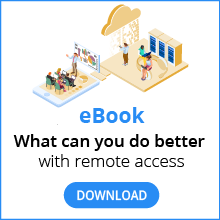 You can disable cloud connections but, providing the computer remains connected to the Internet, leave the computer in communication with RealVNC’s cloud service. This means the cloud service will automatically apply your new license key each time you renew, saving you having to apply it manually. Alternatively, set the underlying AllowCloudRfb parameter. You can remove the computer from the team altogether, so that it never ‘phones home’ to RealVNC’s cloud service, and can be disconnected from the Internet. Note this means you will need to manually apply your new license key each time you renew.